How would you spend your time if you could live forever? Vampires are one of my favorite monsters in the science fiction and fantasy genres because of how mysterious and dangerous they generally are. I really liked how Kesi and the others like her were described, especially when it came to their interactions with humans. It made sense that people would respond to these creatures quite differently depending on the culture they came from and what kinds of experiences they’d had with vampires in the past. This was well done. I would have liked to see a little more attention paid to Kesi’s character development. There were a few times when she reacted to certain events in the storyline the exact opposite way I would have expected her to behave. The explanation she gave for why she acted that way was so brief that I almost overlooked it. While it did make sense, it would have been helpful to have additional information about why she seemed to act so out of character in those specific instances. I would have especially liked to know more about her reaction to her husband’s death early on in the book as it was the most puzzling mystery of them all. With that being said, I was so fascinated by the premise that I couldn’t stop reading it. The pacing was strong and steady from beginning to end. There simply weren’t any good places to take a break because every single scene was so packed with intriguing clues about what might happen to Kesi. I simultaneously couldn’t wait to see what she would do next and desperately didn’t want this tale to end. 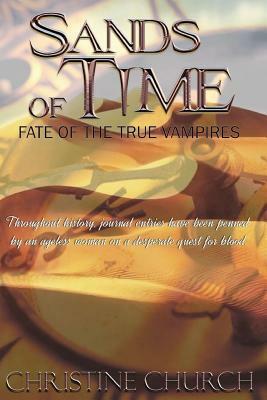 I’d recommend Sands of Time: Fate of the True Vampires to anyone who likes the scary kind of vampire stories.